Standard security deposit for events bookings. Not normally refundable, but exceptions can be made in extraordinary circumstances and with advance bookings. Contact Sir James to confirm dates & availability. A £50 payment to Sir James. A £25 payment to Sir James. Everything you need to have ONE Pub Quiz, just add pens, host & a winners prize! Everything you need to have TWO Pub Quizzes, just add pens, host & a winners prize! Everything you need to have FOUR Pub Quizzes, just add pens, host & a winners prize! 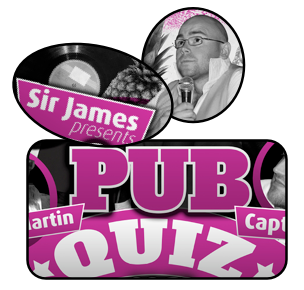 Everything you get with a regular Pub Quiz Pack only you need to print it off yourself! Emailed for FREE, so no P&P. 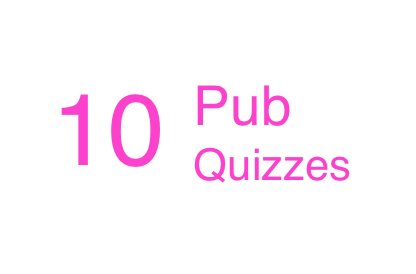 Everything you get with a FOUR QUIZ Pub Quiz Pack only you need to print it off yourself! Emailed for FREE, so no P&P. Everything you get with a regular pub quiz pack x10. Emailed for FREE, so no P&P. 10 Pub Quizzes by Email! A perfect bulk buy for busy bars. All orders are packed and shipped within 2 business days unless otherwise advised. Contact Sir James to confirm special orders and international delivery details.